When the NFIB Small Business Optimism reading for December 2016 was announced in January, the December reading jumped 7.4 points to 105.8. 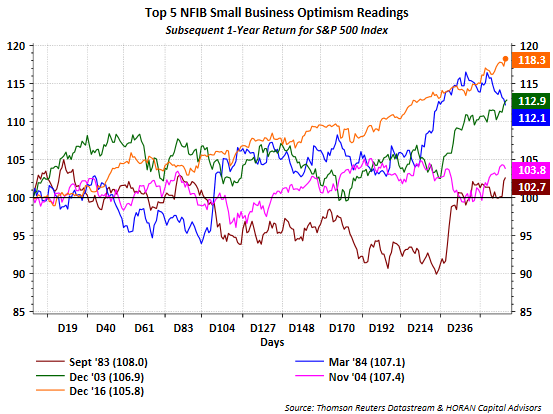 At that time the optimism reading was the fifth highest reading recorded by NFIB. Prior instances of strong optimism readings were followed by positive stock market returns in the subsequent twelve months. 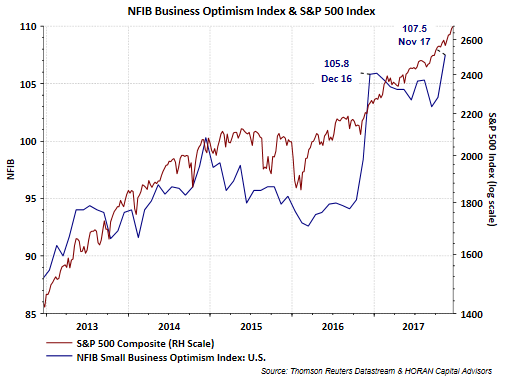 NFIB's Small Business Optimism report last week closed out the subsequent twelve month period from the December 2016 reading and the stock market did not disappoint. As the below chart shows, the S&P 500 Index was up over 18% from December 15, 2016. The market's return was the best performing one out of the other four top NFIB readings. As noted in an earlier post, last week's NFIB Small Business Optimism report has the index at its second highest level in its 44-year history. I will begin tracking the market's performance over the next twelve months and will evaluate the return. If history rhymes at all, 2018 stock market returns would be positive.